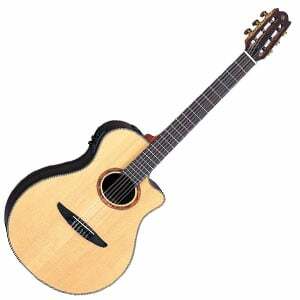 Unlike some other guitars on our chart of the best sub-$1000 classical guitars, which offer a very traditional playing experience, Yamaha’s professional NTX1200R electro-acoustic classical gives steel-string players a familiar experience on a nylon-stringed guitar. Let’s see what makes it so good. Playability is key with the NTX1200R, and it offers a range of features that benefit both electric and steel-string guitarists making the move to classical. These include a slightly narrower 1.89” nut width which is more akin to what you’d find on a steel-string guitar, as well as a slimmer body and generous cutaway. This cutaway allows easy access to the highest frets of the ebony fretboard (there’s a total of 22, which is considerably more than many standard classical guitars). On the subject of woods, the tonewoods used in the body construction are impressive. As well as an African rosewood neck, there’s a naturally finished solid spruce top – decorated with a very attractive wooden rosette – paired with glossy solid rosewood back and sides. Interestingly, these woods have been treated to Yamaha’s ‘Acoustic Resonance Enhancement’ (A.R.E), which is essentially a wood manipulation method, to help it sound more played-in. As you’d expect from a $1000 Yamaha, the craftsmanship is excellent, and offers a sleek and comfortable playing experience. The body and neck are clearly very good, but the highlight is actually the electronics. The NTX1200R is loaded with Yamaha’s ART two-way pickup system, with a pickup on both the treble and bass side of the guitar. These are tended to by the advanced System 61 preamp, offering both a master volume dial and individual control dials for each pickup, as well as three EQ sliders, and a digital tuner. Elsewhere, there’s an ebony bridge, while the open-gear tuners are decent and hold tuning very well. The guitar comes strung with a set of Savarez D’angelico Light Tension strings, and is shipped in a plush and protective hard foam case. Quite a good haul for the price. The brightness of the spruce meets the woody warmth of the rosewood, for a sweet, smooth and balanced sounding guitar, that benefits from the A.R.E – it does have a touch of vintage warmth about it. The thin body combined with the cutaway means it lacks a little depth and volume (when compared to other all-solid-wood guitars), but this is no problem through the versatile pickups and preamp, which allows for ample sound shaping. For more info about the Yamaha NTX1200R, click here.